I gotta disagree with you on this one, I enjoyed this film and I really liked Rnadall in the lead. Randall wasn't bad...we felt it was run of the mill. Run-Of-The-mill? Perhaps, but still entertaining with some pretty good action. It is a shame Randall isn't as well known as Rothrock, though she was actually in a few other action films, she had a bit part in "Detour" she played a terrorist in the Demolition High(Die Hard in a school, I tihnk you'd enjoy that one more then Detention) and she was also the lead in "The Assault", which was really good, (basically a remake of Assault On Precinct 13 with a mostly female cast). She was also pretty good in Trancers 4 and 5. Unfortunately she also had the misfortune of appearing in some real stinkers like Evil Obsession, i've also heard bad things about First Encounter. Have been away from blogger for a bit, good to be back. Love the review, I kinda still want to watch this one but I might be more in love with the title than anything. Thanks for the great review Ty. Venom: There were some decent moments with Randall. Thanks for all the info! Will have to check out The Assault. John: Happy you're back! You welcome. The title is great, the movie is not unfortunately. Been thinking whether to pick this one up. Thanks for the warning Ty, I'll stick with the TIG original. Your welcome! The original is the best. TIG rocked in that. 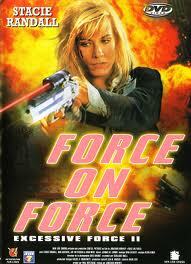 Haven't FORCE seen this one, but FORCE I remember it playing FORCE on HBO non-stop FORCE back in the day. For(ce) me, if it doesn't FORCE have Thomas Ian FORCE Griffith, for(ce)get about it. LOL! That was one of our best comments. So much FORCE! Haha! It is an amazing amount of Force!